Losing your vital data stored on an SD card can be heartbreaking and leave you feeling powerless, especially if they contain sentimental things like photographs of you and your loved ones or part of an incredibly important work project. It can leave you in a state of frustration where you end up scavenging your computer, phone or cloud storage looking for any trace of the missing files, praying that you may have made duplicates somewhere and it will all be over. But you no longer need to mourn your SD card. Data recovery software is now so advanced theses days that there is now a solution to recover your lost data, and that solution is Boomerang Data Recovery. Boomerang Data Recovery is a state of the art data recovery service which can revive lost, deleted, damaged or corrupt files and even deleted partitions for both Windows and Mac users. It may sound impossible which is not surprising, but Boomerang Data Recovery can search any storage space, including your SD card, for files which may once have existed there and bring them back you. It can even recover files from your old iPod. You will be amazed. You will never have to worry about losing files on your SD card again. Boomerang Data Recovery is the end product of years of research and refinement and is the best data recovery product available. Not only can it bring back your lost SD card files, it can also recover files from other flash or memory cards, and even hard drives, RAID, and USB storage devices. Boomerang Data Recovery is also compatible with a significant range of Microsoft operating systems including Windows 98, Windows NT, Windows 2000/2003 Server, WinXP, Vista and Windows 7, 8 and 10, as well as a large range of Mac operating systems from Mac OS X 10.4 and up. If you’re someone who regularly needs to back up their files, Boomerang Data Recovery is going to save you a lot of worry. 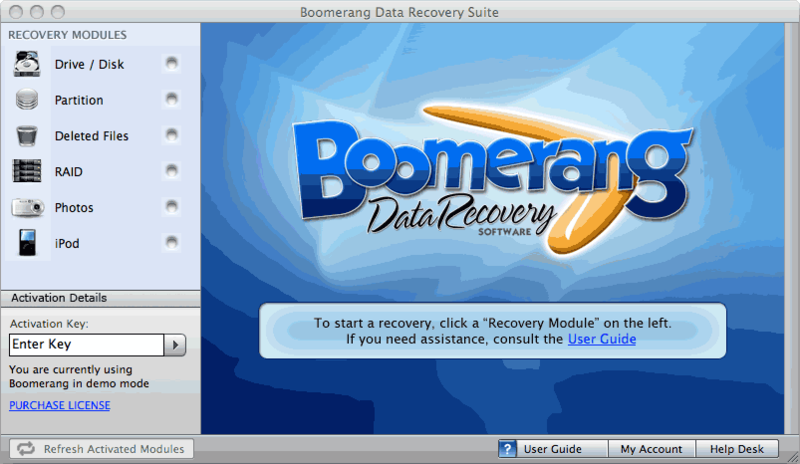 Whether you need a recovery service for home or the workplace, Boomerang Data Recovery has three specialized packages available depending on your needs (Boomerang Home Edition, Boomerang SMB Edition and Boomerang Pro Edition, which is designed for IT companies and recovery labs), all of which are effective and affordable. Still, you don’t believe it’s possible? Download the free trial now and test it for yourself. You will be up all night searching your computer and devices for lost files, we guarantee it. Lost data? We can bring it back! Easily tackles any type of data recovery, including deleted partitions, lost or damaged hard drives, RAID, camera/flash/memory cards.. almost anything! Our recovery application is the result of years or research and refinement and is the best choice for getting your data back quickly and affordably. *We take your privacy seriously. Copyright © 2009-2018 Boomerang Data Recovery. Powered by Creatioshop eCommerce.